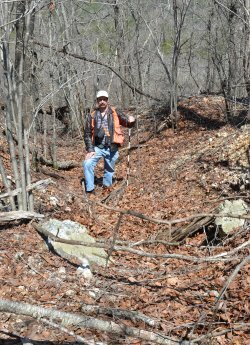 Documenting a historic quarry trench in Polk County. 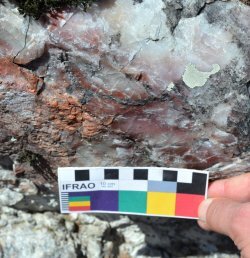 White to pink novaculite outcrops at a Polk County quarry. 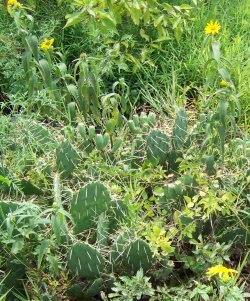 Sunflowers and cactus thrive in the disturbed habitat of a quarry. Novaculite outcropping at quarry 3PL57. A novaculite exposure at quarry 3PL349. Size-sorted novaculite debris, AAS/HSU Archeology Lab. 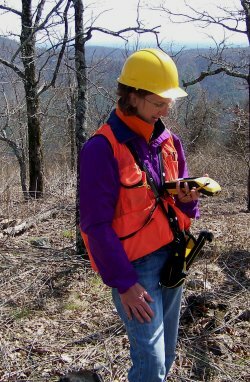 Mary Beth Trubitt collects GPS information at quarry 3PL57. 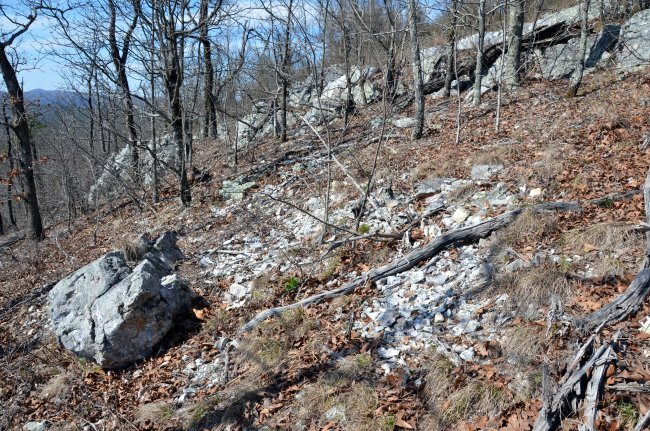 Novaculite boulders and debris on a mountain ridge in Polk County. 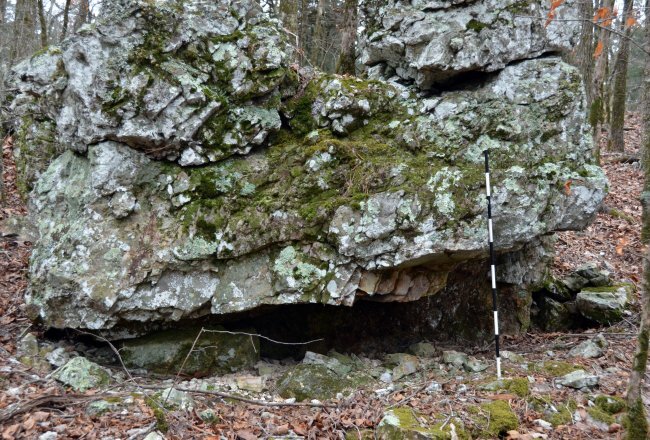 Novaculite bedrock is exposed on the steep mountain ridges in the Ouachita Mountains of western Arkansas. Native Americans quarried novaculite from numerous ridge-top locations in Polk County. Later Arkansans prospected for novaculite, manganese, or other resources here. Many of these locations are now recorded as archeological sites. 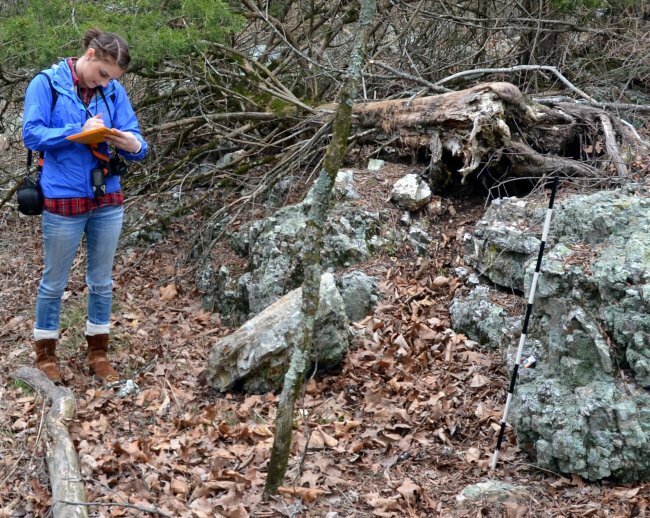 Henderson State University student Kalyn Duggan records information at novaculite quarry 3PL770. 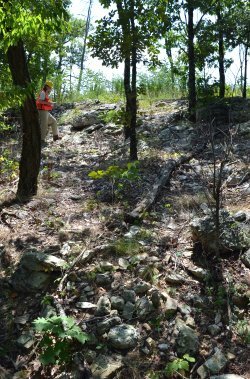 One novaculite quarry in Polk County, recorded as archeological site 3PL349, was the site of a mapping and testing project as part of the 1993 Arkansas Archeological Society Training Program. The team, led by Jerry Hilliard, created a scale map of the novaculite ridge crest, showing boulders, concentrations of novaculite chipping debris and sandstone hammers, and a possible quarry trench. They excavated two 1x1 meter square test units in an area of boulders and surface flakes. A large quantity of novaculite debris was collected from the 20 centimeters above battered novaculite bedrock. Map of Novaculite Quarry 3PL349 showing locations of 1993 test excavation units A and B (from Hilliard 1999:Figure 22). Over several years, Mary Beth Trubitt (Arkansas Archeological Survey), with Arkansas Archeological Society members and Henderson State University students, analyzed materials from that 3PL349 quarry excavation. Some naturally-broken novaculite pieces were found, weathered on all surfaces. The waste fragments left by quarrying and chipping by people in the past had relatively fresh breaks. Cortex or a weathered surface was present on about a third of the collection. Pieces of chipping debris (angular shatter, flakes, and flake fragments) were recorded as artifacts. Few cores, biface fragments, or tools were found in TU A and B. Pieces of angular debris or shatter are commonly seen at novaculite quarry sites. 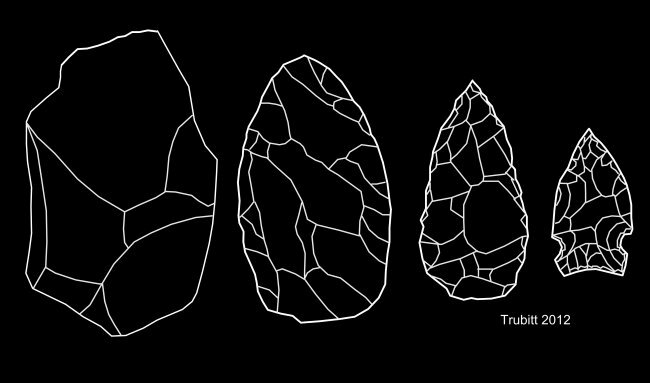 The different stages of stone tool production – quarrying the raw material, initial testing by chipping, heat treatment, further thinning and reduction, and shaping the final tool – were done at different locations. 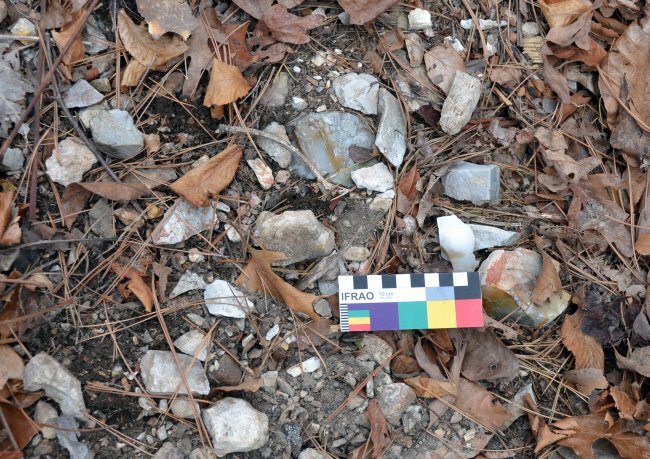 Because by-products of stone tool manufacturing are durable, archeologists can track the process across the region by examining the kinds of novaculite artifacts found at different sites. What activities were done at quarries, at workshops, and at camps? In what form did Native Americans transport novaculite, and what was left behind? The reduction of novaculite – from blocky pieces to finished tools – was done at different locations. At the Arkansas Archeological Survey’s Henderson State University Research Station, we have developed a system that combines mass analysis of novaculite chipping debris with individual analysis of novaculite flakes. One step is size-sorting novaculite debitage from excavations. Patterns emerge from comparisons between different sites. For example, at quarry site 3PL349, the majority of pieces of novaculite chipping debris are larger than ½” in size. 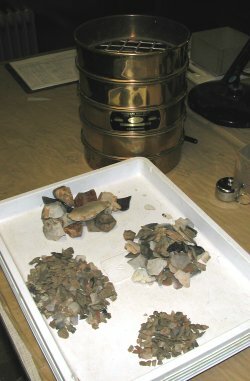 By weight, the debris caught in the 1” geological sieve makes up the bulk, about 70% of the overall weight. Comparisons between sites show that the size distribution of novaculite chipping debris changes from one site type to another. As novaculite was carried further from the quarry, it was chipped and reduced in size. Most of the chipping debris left on quarries was large, but debris at workshops and residential sites was smaller in size and lighter in weight. 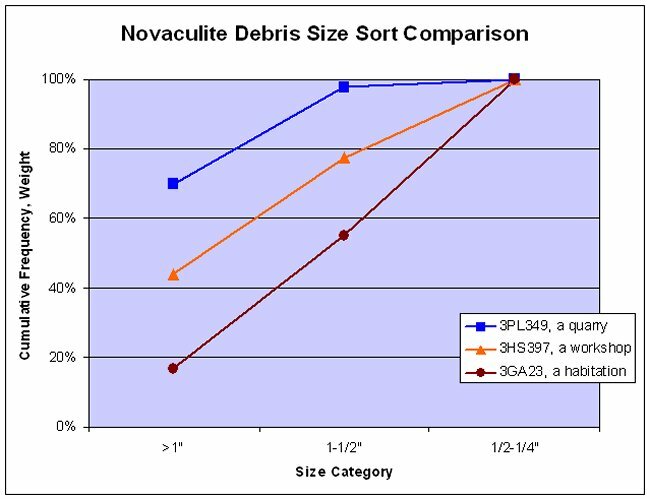 Comparisons of novaculite chipping debris size profiles from three different sites. A novaculite boulder with undercut feature at 3PL770 (scale is 1 meter). For photographs and descriptions of raw material samples from Polk County, select a site below or go to the Comparative Collection page. Andrefsky, William, Jr., editor (2001) Lithic Debitage: Context, Form, Meaning. University of Utah Press, Salt Lake City. Bradbury, A. P. and P. J. Carr (2004) Combining Aggregate and Individual Methods of Flake Debris Analysis: Aggregate Trend Analysis. North American Archaeologist 25(1):65-90. Etchieson, Meeks and Mary Beth Trubitt (2013) Taking it to the River: Arkansas Novaculite Quarrying and Archaic Period Tool Production. North American Archaeologist 34(4):387-407. Hilliard, Jerry (1999) A Preliminary Report on 3PL349, a Novaculite Quarry Site. The Arkansas Archeologist 38:22-24. Trubitt, Mary Beth (2007) The Organization of Novaculite Tool Production: Quarry-Workshop Debitage Comparisons. Caddo Archeology Journal 16:71-89. Trubitt, Mary Beth D., Anne S. Dowd, and Meeks Etchieson (2013) Multiscalar Analysis of Quarries. 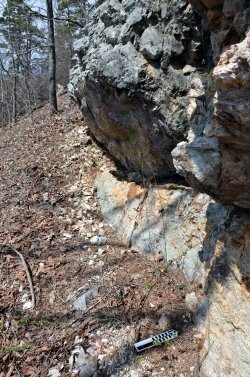 The Quarry (e-newsletter of the Society for American Archaeology’s Prehistoric Quarries & Early Mines Interest Group) 10:30-43.